A while back I met up with Todd from New York when he was passing through Las Vegas. He didn't have a lot of time for climbing, so we headed out to Calico Basin to look at some short routes. Todd was up to pulling some hard moves but he diplomatically left route selection up to me. "Well," I reasoned out loud, "there is this route I've had my eye on, Riding Hood (5.8). The Swain guidebook says something to the effect that the route doesn't look too good, but you never know from a distance. Besides, it is an old John Williamson route, and you can always count on some good adventure on a John Williamson route. The route was first done in 1970, back 'when boys were men and men were a little better.'" Todd is accommodating, and says OK. As we scramble up to the base, Todd mentions that as a Gunks climber, he has not polished his crack technique, so I am welcome to lead the dihedral above. That's fine with me, so we tie in and I start up. The climbing is easy, but the rock is kind of soft. Large holds have a tendency to fall off, and small ones simply disappear in a little cloud of dust. I lead past some bail gear, but it does not worry me. I've been pretty lucky at retrieving bail gear from Williamson routes. Soon the dihedral turns into a chimney with a beachball sized chockstone blocking the way. This does worry me, so I do a few contortions to pass by without touching it. A short distance above I set up a belay in an alcove beneath the steep upper crack. 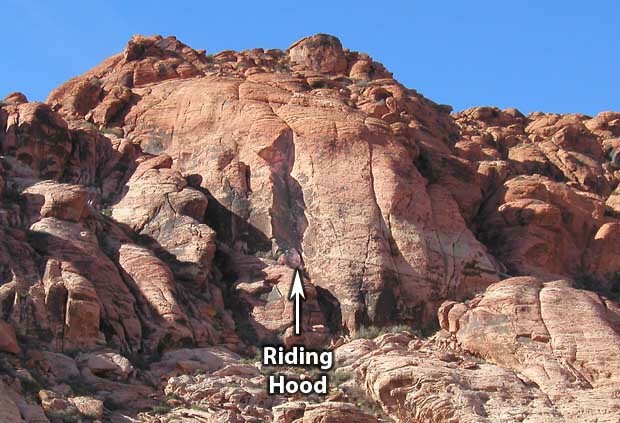 The Riding Hood dihedral in the Calico Basin. Physical Graffiti is the sunlit crack system to the right. Todd quickly follows, marvelling at the fragile nature of the rock. Apparently, back in the Gunks, the expression "solid as a rock" has some kind of literal meaning. I assure him that much of the Red Rock stone is of high quality. At this point he has reached a ledge by the beachball chockstone, and he courteously pauses for me to finish my sentence. Unfortunately, he gently rests his hand against the chockstone, which rotates six inches before gaining a new position of partial stability. To add further entertainment value, its new position has trapped the rope. There is no sane way to move the boulder, so I drop him a loop of rope for a new tie-in, and he unthreads the trapped portion using the sort of care I associate with bomb-squad technicians. 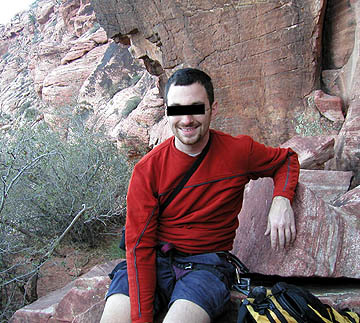 He duplicates my contortions, and joins me at the belay spot. The route continues straight up a flake on the vertical wall and reaches the base of the upper dihedral about fifteen feet up. Since the upper dihedral is where the serious jamming starts, I get to lead this too. The bad news is that I am stymied by the flake. "Can't you just lieback up to the main crack?" asks Todd, helpfully. I'm kind of worried about pulling out on the four-inch thick slice of petrified mud, and I'm unable to find a combination that won't involve a quart and half of adrenaline. Todd, who seems to have forgotten the beachball and the puffs of dust, offers to take a whack at it. I don't have any better ideas, so we swap ends of the rope. He studies the move for a moment, then gracefully rises to the dihedral above. He gets a good cam in the base of it and looks over the next moves. He mentions that it appears pretty committing for a guy who is not relaxed in jamcracks. I reason that the dihedral can't be as bad as the flake, which was certainly 5.8, so after a brief discussion, he turns the lead back over to me. The security of the toprope elevates the lieback flake slightly out of the insane range, but I am still worried that I will pull off a forty pound chunk of sandstone which will hit me in the face before dropping down to kill Todd. Tiptoeing as delicately as I can, I shakily reach the handjam at the bottom of the dihedral. Yikes! It is steep! I manage a few more jams that feel about 5.9, then it starts to get tough. Desperately, I try to stem with my right foot, but the optical illusion I plan to use as a foothold has the structural integrity of silt with a thin lubricating coating of dried lichen. I opt for smearing an area that offers the comparative security of plain lichen, without the silt, and hurl a hex into the only constriction between me and Jupiter. Strength ebbing, I need to pull up and get a chicken wing into the now off-width crack above me. The fact that the only usable handjam is occupied by my number nine hex ensures an ironic end to my ordeal. Wasted, I sink onto the rope and try to shake the numbness out of my arms. Probably as a result of reasoning faculties being impaired by exhaustion, I somehow conclude that I need to get a cam deep into the back of the overhanging off-width in order to remove the obstructing hex. I launch a sequence of agonizing thrutches, massive exertions, and hopeless aiding and manage, in the short span of 45 minutes, to get two cams placed in such a fashion that they now completely block the removal of the hex. Bereft of strength and hope, I lower back to the ledge. I am thankful that Todd does not openly question my sanity, but it is difficult to imagine that he does not have serious doubts. Whatever his thoughts, he gamely ascends to my highpoint and begins the task of untangling the mess I have made. The difficulty of this job is enhanced by the geometry of the crack and the mutually obstructing gear placements. It probably takes him as long to get things taken apart as it took me to put them together, but he finally succeeds. Beyond that, he manages to squirm up a few more feet and place the number 4 cam in a good location. Depleted strength reserves and the ominous off-width above combine to suggest another lead change, so he descends to our ledge. I wryly mention to him that it is rare for a short crag route to provide such an opportunity for teamwork. It is testimony to his benevolence that when he smiled in acknowledgement, I detected no apparent rolling of the eyes. I climb back up, fatigue dulling even the fear I feel passing the flake. But Todd's work was good, and I manage to pull myself into the constricted pod where he placed the good cam. The next moves are not actually easy, but compared to what we have already been through, they seem like a stroll. Shortly, we are shaking hands on top. Protecting the innocent . . . In the few moments it takes to descend to our packs, I am able to take a few deep breaths and reflect. We made it! We're uninjured (aside from a few scrapes and muscle aches). We didn't lose any gear. Todd listens patiently as enthusiasm overcomes me: "That was amazing! Five lead changes to climb 40 feet of rock! How can they say this route doesn't look good? This was MORE than a route-- this was an EXPERIENCE! How can you beat that? Didn't I tell you that you could expect a good adventure from a John Williamson route?" Todd smiled at this point. I can prove it, because I snapped a picture. I guess Todd's travels have not taken him out west since then, because for some reason, I never heard from him again.